Concrete is the most demanding material which is made of cement, aggregates, water and admixtures. To get the best quality of concrete, ingredients of concrete are pre-designed. If the ingredients of concrete are not as per pre-designed proportion or not properly mixed with each other then there are chances of getting poor quality concrete. 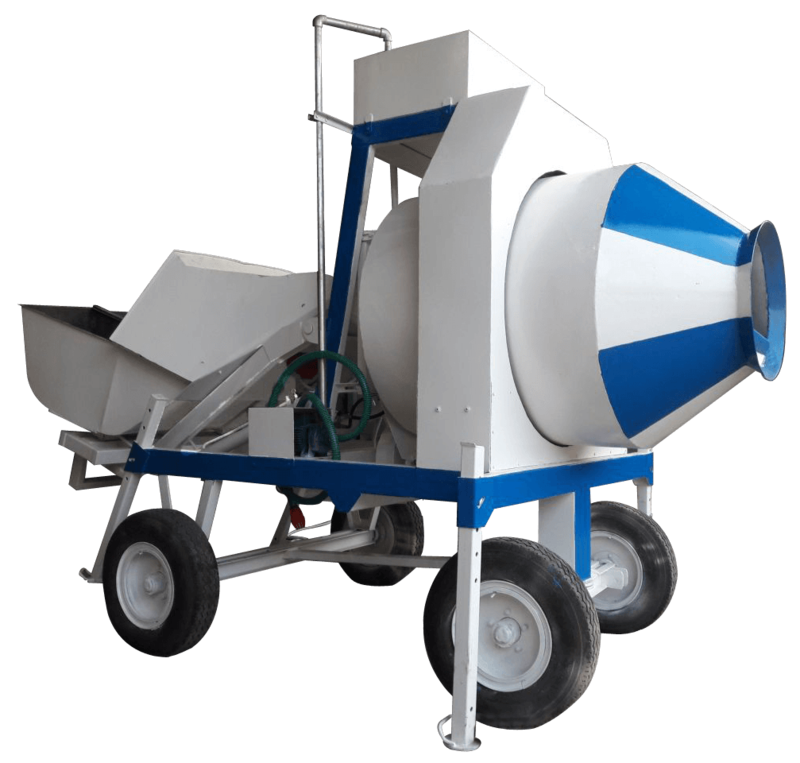 Concrete mixers are the machines which mix the ingredients of concrete and make the concrete paste in the workable condition. In other way, the machine used for mixing concrete is known as the mechanical concrete mixer, or simply concrete mixer. Concrete mixer is used to mix cement with aggregates including sand or gravel, and water to form concrete. The concrete mixers must not only achieve the uniformity of the mix, but they should also discharge the mix without disturbing that uniformity. In absent of concrete mixers, concrete is often mixed manually or on small jobs. But due to the carelessness of the labour, sometimes concrete is mixed poorly or frequently it is over-mixed. Hence it is advisable to use concrete mixers to mix the concrete properly. Whatever may be the method of the mixing of the material of concrete, it should be done thoroughly to ensure the uniform distribution of materials in concrete mass and this can be judged by uniform colour and consistency of concrete. Remember mixing is heart of concrete and poor mixing means it is not concrete. Continuous mixers are used in massive constructions such as dams, bridges, etc., which involve the use of large masses of concrete and also require the continuous flow of concrete. In continuous mixer, the weighing, loading, mixing of concrete ingredients as well as discharge of concrete occur continuously and simultaneously. It mixes ingredients continuously and in a single pass. Batch mixer is most common types of mixer and it is widely used to mix the concrete ingredients. It consists of a revolving drum with blades or baffles inside it. In this type of mixer, all the materials of the desired proportioned mix are fed into the hopper of the revolving drum and then drum on being rotated at a certain speed, mixes the materials with the aid of a series of blades provided inside. The resulting mix is finally discharged from the drum and conveyed for use. The batch mixers are further classified in to drum types mixer and pan types mixers. Tilting mixers have a conical or bowl-shaped drum with vanes inside. They are preferable for mixes of low workability and for those containing large size aggregate. The mixing chamber which is known as drum, is tilted for discharging. In non-tilting mixers, the mixers are not allowed to tilt and the axis of the mixer is always horizontal. The discharge is obtained either by inserting a chute into the drum or by reversing the direction of rotation of the drum or rarely by splitting of the drum. In Non-tilting mixers, mechanism of drum also comes with reversing arrangement which is known as Reversing drum mixers. In reversing drum mixer, the ingredients of concrete rotate in one and other direction and discharge from the opposite direction. Pan type mixer consist cylindrical pan that contains sets of blades which mix the concrete ingredients. Generally, the mixture of concrete is discharged from the bottom of the pan. Next PostNext Home Environment For Kids: Understand Their Lifestyle & Bedroom Furniture!